NEW releases here at Paper Sweeties !!! And we are so excited to be back! Don't you just love this gum ball machine??? It is from one of the new January releases called Sweet Treats. I filled the gum ball machine with pretty sequins and made a shaker card! I made my own background paper with the sentiments of this new stamp set! I just stamped them over and over with Simon Says Fog ink. I hope you can see this in the photo. The pretty banner was made with Washi tape and twine. 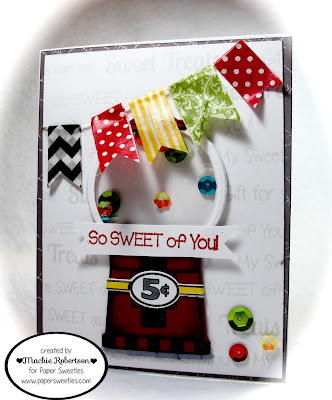 I really enjoyed making this fun card with the new Sweet Treats stamp and Sweet Cuts! Hope you will come back tomorrow and see more sneak peeks of the January Releases here at Paper Sweeties! Please visit my Paper Sweetie Teamies for some fabulous inspiration! Love your sweet gumball machine card!!! Great background my dear! I love your card--so bright and colorful! That banner idea is very creative too! It's been a crazy week, hasn't it? Take Care! Super fun card, Mackie! Love your stamped background and that banner adds a great touch! Fun, fun shaker, Mackie! Love the flag banner! And you bg is wonderful! What an adorable gumball machine!! Fun!! So fun with the banner!! And, awesome gumball machine... Well done!!! What a fun, bright and cheerful card! Love how you turned the Sweet Cuts into a shaker and your banner using washi is fantastic. Oh how fun! What a great idea to use sequin as your gum balls. This is terrific!